Five schools were represented in the teams winning through to the semi-finals - last years winners Stenness, St Andrews, Papdale and a combined St Margarets Hope/Burray team. The semi-finals were tight affairs with both ties goaless at half time with Stenness coming the closest to scoring in their tie when they hit the crossbar. In the second halves surprise team Hope/Burray scored a couple of goals to defeat Papdale B by 2-0 and in an even tighter game a goal in the dying seconds earned St Andrews B a narrow victory over Stenness. The final itself was a hugely exciting match. St Andrews took the lead midway through the first half, a lead which they held at half time. At this stage St Andrews were in control of the game but Hope/Burray came out more determined in the second half and put in a much stronger performance. They deservedly equalised and almost clinched the game in the final seconds with a breakaway opportunity. Chances in extra time were limited and with the scores level at 1-1 it was onto a penalty kick shoot out. St Andrews missed the target with a couple of kicks and a third was saved by the Hope/Burray keeper resulting in a 3-1 victory for the combined schools team. At the outset of the competition Hope/Burray would not have been considered amongst the favourites but they thoroughly deserved to win the Gilmour Shield winning all their games, scoring 30 goals and losing only a single goal in the final. At the end of the competition Jim Cormack OYDG Chairman commented that the excitement of the primary schools competition was a perfect ending to a very successful few weeks for Orkney youth football. He thanked the teams especially Hope/Burray in winning the competiton for the first time, the referees, Picky groundstaff and sponsor Bob Gilmour. 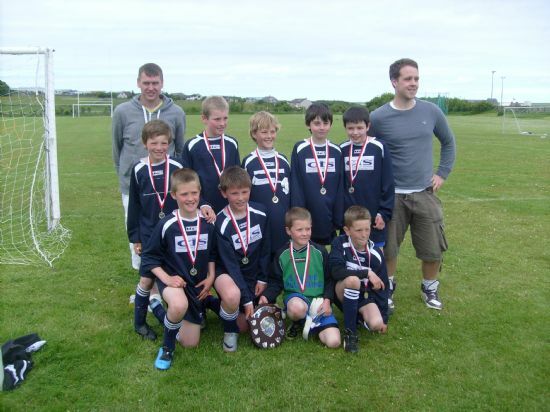 Unfortunately Bob was unable to attend to present the Shield due to illness and another long-term sponsor of youth football in Orkney Raymond Rendall stepped in at short notice to present runners-up medals to St Andrews and the Shield to Hope/Burray. Quarter Finals:- Papdale D 0 Stenness 1; Papdale C 0 Papdale B 2; St Andrews B 3 Papdale A 2; Hope/Burray 8 Firth 0; Semi Finals - Stenness 0 St Andrews B 1; Papdale B 0 Hope/Burray 2; Final: - St Andrews B 1 Hope/Burray 1 (a.e.t. ), Hope/Burray won 3-1 on penalty kicks. 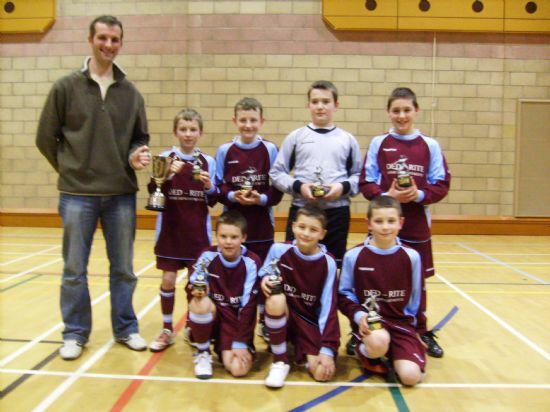 The 2009/10 Primary Indoor 5-a-side League sponsored by S & JD Robertson kicked off on Saturday 24th October at 4pm in Picky. Follow the link HERE for details of all the results. The climax of the Primary Indoor Football League took place at Picky on Saturday night watched by a large crowd of spectators. Needing only a single victory to clinch the league for the second season in a row, the biggest challenge facing St Andrews Hurricanes was to maintain their perfect 100% record by winning all their final four matches. They had a shock in their first game against Real Dounby when Real scored an early opening goal but Hurricanes soon got into their stride and won the match 3-1 to win the league to the delight of their supporters. Two further victories followed which left Hurricanes needing to beat their great rivals Papdale Flyers to maintain their perfect record. With both teams receiving excellent support from the sidelines it was Hurricanes who turned on the style winning the game comfortably by 3 goals to 1. This ended a remarkable season for the Hurricanes in which they set new standards for Primary Indoor Football scoring a total of 208 goals and only conceding 5. Congratulation go to the team and their coaches on an excellent achievement. The only other time that a team has gone through the season with a 100% record was some 16 years ago when Papdale Flyers won all 30 games in a 16 team league. Flyers ended the season as runners-up, 18 points behind the Hurricanes.The race for third place in the league was a closely fought affair between Papdale Kings and Stenness Falcons. The Kings had started the night one point ahead but they slipped up in their games against Firth Scorpions who played well to earn a 1-1 draw, and they were also held to a 1-1 draw by Glaitness United in a tight game where both teams had chances to clinch victory. Stenness Falcons took full advantage as they won all their four games including an impressive 4-0 victory over Hope Hotspurs. Again this was an excellent achievement for the Falcons who the previous week had clinched the Shore Shield for the best placed small primary school, a trophy they have now won for the last 3 years. Other teams who improved their league placing on the final night were St Andrews Dynamos who moved into the top ten just ahead of Glaitness Spurs and Burray Boomerangs who drew level with Orphir Torpedos in the lower half of the league.There were many closely fought games including an end to end game between Inter Dounby and Glaitness United which ended scoreless. Lower placed teams performing well and holding higher placed teams to draws included Boomerangs against Papdale Mighty Marvels, and Marvels against Real Dounby. Papdale Vikings also played well to beat top eight side, Inter Dounby by 2-1. The presentation of trophies was held after the final match was played. Jim Cormack, OYDG Chairman opened the presentation ceremony by commenting on the high standard of football that he had witnessed over the winter months - the best in his 3 years as Chairman with Hurricanes setting the standard but good perfomances from all the teams especially Flyers, Falcons, Kings, United, Hotspurs and Dales. 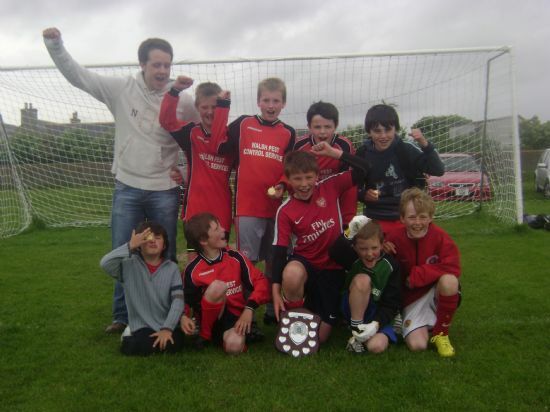 He also highlighted that the best atmosphere for any game was when the two bottom teams - Glaitness Rovers and Stenness Pumas played a couple of weeks ago which showed that all the teams made a major contribution to what OYDG considered to be the flagship youth football tournament in Orkney. He concluded by thanking all those that had contributed to such a successful competition - Picky management and staff, fixtures organisers, referees, timekeepers, scorers, teams, coaches, parents and supporters. Finally, OYDG would like to thank the very generous sponsorship of the Primary Indoor Football League by the S & JD Robertson Ltd Group. The company is in its 23rd year of sponsoring the competition and the Youth Development Group is indebted for this long standing and continued support. St Andrew's Hurricanes stand one victory away from retaining the Primary Football Indoor League after the second last week of fixtures which took place at Picky on Saturday night. With all teams now having only 4 matches left to play Hurricanes lead the league by 14 points over Papdale Flyers and only need to win one of their final four fixtures to clinch the league for the second year in a row. Remarkably after 36 games they still have a 100% record and have only conceded 3 goals all season. In the top match of the week Stenness Falcons narrowly beat Glaitness United by a single goal in the race for third place. Having taken an early lead they defended well to hold on for victory. As a result of their 3 victories on Saturday the Falcons have clinched the Shore Shield for the best placed small primary school in the league. This is the third year in a row the Falcons have won the Shore Shield and completes an excellent 12 months in which the school also captured the outdoor primary competition, the Gilmour Shield last June. Papdale Kings who also won all their games remain in third place one point ahead of the Falcons and 7 points ahead of Glaitness United. Hope Hotspurs who are also in the hunt for third place suffered an unfortunate blow when one of their key players was injured in their first match of the night against Hurricanes and was unable to take further part in their other two matches. This no doubt contributed to them losing to both Evie and Papdale Dales although both these teams played well to secure their victories. Hotspurs did have the consolation of being only the third team this season to score against the Hurricanes. The only other team to gain maximum points on Saturday night were Inter Dounby who look set for a top eight finish ahead of their schoolmates Real Dounby. There were a number of exciting and very competitive games played with narrow victories for Falcons against Real Dounby, Burray Boomerangs against Stenness Pumas, a late goal giving United victory over Real Dounby, an early goal giving Inter a narrow win over the Dales and St Andrews Dynamos versus Stromness Predators ended goalless. There were goals galore in the Evie versus Kings and Dynamos versus Glainess Spurs matches both ending 4-3. In the latter game Dynamos scored six of the seven goals which include a couple of own goals. Orphir Torpedos staged the comeback of the week coming from 2-0 down to draw with Firth Scorpions and Burray Boomerangs enjoyed their best score of the season - a 6-0 win over Stenness Pumas. There will be a number of intriguing games on the final night of the season as teams battle to improve their league placings. Barring a disaster St Andrews Hurricanes will be crowned champions and will be all out to finish the league undefeated and with a 100% record. They will face a stiff challenge in their final match against second placed Papdale Flyers who will be going all out to avenge a 1-0 defeat earlier in the season. Papdale Kings will need to win all their final four games to be certain of finishing in third place ahead of Stenness Falcons but they will need to be at their best to overcome Glaitness United. Elsewhere Hope Hotspurs and Papdale Dales will be battling for sixth place in the league and mid table only four points separate 5 teams so their could well be changes on the final night. Papdale Flyers lost the opportunity to draw level at the top of the Primary Football Indoor League after the Week 13 fixtures. In their bid to gain maximum points on a night when leaders St Andrews Hurricanes were not playing they were cuaght out in their final match with Inter Dounby when they were held to a 1-1 draw. In a game in which the Flyers created many chances but could not take them, and Inter defended well, a goal in the last second of the match earned the Dounby team an unexpected draw. The race for third place is hotting up with three teams battling it out. Third placed Stenness Falcons lost the top match of the week 3-0 against the Flyers and they also dropped a couple of points against Papdale Vikings who played very well to earn themselves a 1-1 draw. Both Papdale Kings and Glaitness United who won all their games took advantage of this slip up with the Kings now taking over in third place one point ahead of the Falcons who are now only two points ahead of United. The only other team to gain maximum points were Hope Hotspurs who remain in sixth place. There were good performaces by some of the lower placed teams against higher placed teams with Stromness Devils leading the way and producing their best victory of the season of the season - an excellent 5-0 victory over Papdale Vikings. Papdale Mighty Marvels also had a good 2-1 victory over Glaitness Spurs. Orphir Torpedos were unlucky not to hold out in their game with Stromness Predators with a goal in the last second by the Predators denying the Torpedos a victory. On the night there were a number of very close games with 11 games ending in draws or single goal victories. Firth Scorpions were involved in three of the tightest games drawing with Predators and Real Dounby and losing narrowly by a single goal to Hotspurs. The clash of the two bottom teams produced the best atmosphere of the night with both Glaitness Rovers and Stenness Pumas receiving excellent vocal support from the sidelines. At the end of a game in which both teams gave their all Rovers denied Pumas their first point of the season with a narrow 1-0 victory. Its as you were at the top of the Primary Football Indoor League after the Week 12 fixtures which took place on Saturday at Picky. St Andrews Hurricanes continue to lead the league by 12 points over Papdale Flyers with both teams having 7 more games to play. The St Andrews team remain undefeated with a 100% record having played 33 games. In the top matches Glaitness United played well to hold the Hurricanes to a single goal victory and the Hurricanes also had a relatively easy 4-0 victory over Papdale Kings. Hope Hotspurs continued their good form winning two games and earning a very creditable 1-1 draw against the Kings. Other than Hurricanes and Flyers the only other team to gain maximum points on Saturday night were Inter Dounby. Stenness Falcons who were not playing on Saturday remain in third position 5 points ahead of the Papdale Kings. There were a number of very close games on the night with six of the games ending in draws. Some of the lower placed teams put in good performances against higher placed teams with Orphir Torpedos beating Papdale Mighty Marvels and holding Papdale Vikings to a scoreless draw. Burray Boomerangs also did well to hold Real Dounby in another game where no goals were scored. The final game of the night proved to be the most exciting with Papdale Vikings coming from 2-0 and 3-2 down to finally edge out Glaitness Spurs 4-3 in a thriller. St Andrews Hurricanes consolidated their lead at the top of the Primary Indoor Football League after the Week 11 fixtures which took place on Saturday at Picky. Whilst the Hurricanes won their 3 games comfortably their nearest challengers Papdale Flyers were unexpectedly beaten 1-0 by Hope Hotspurs. This was the result of the night and was a fully deserved victory for Hotspurs who also came close to adding to their lead on a couple of occasions. Hurricanes lead at the top of the league is now 12 points. Stenness Falcons who are having a very good season continued to impress winning all their 3 games including an excellent 1-0 victory over Papdale Kings. This has helped them strengthen their claim for third spot in the league ahead of the Kings. It was also a very good night for Papdale Dales and Inter Dounby who won all their games. As a result Inter climbed 5 places in the league to edge ahead of their schoolmates Real. There were a number of very close matches on the night with a single goal deciding six of the matches with the match between Papdale Vikings and Real Dounby being decided by a late penalty. Comeback of the night was from the Stromness Devils who came back from 2-0 down against Evie to score on the final whistle and earn themselves a well deserved draw. Finally, Burray Boomerangs enjoyed their best win of the season - a 6-0 victory over Orphir Torpedos. The two top teams had their first encounter. In a fast moving match, St Andrews Hurricanes beat Papdale Flyers by one goal to nil. This means Hurricanes have won all their 27 matches and lead the table by 8 points. Stenness Falcons, Papdale Kings and and Hope Hotspurs also won all 3 of their matches. 7th placed Hotspurs beat 3rd placed United by 2 goals to 1. Hotspurs victory was due, in part, to some excellent saves by their goalkeeper. Evie, Devils, Mighty Marvels and Pumas goalkeepers also had good games. Glaitness United showed excellent sportsmanship when they helped a Boomerangs player who had a minor injury. With the two top Papdale teams faltering, St Andrews Hurricanes increased their lead at the top of the Primary Indoor Football League in the final week before the competition broke up for the Christmas break. In the game of the night the Hurricanes had a comfortable 4-0 victory over the previously undefeated Papdale Kings. The Kings suffered further disappointment when they lost a closely fought game 1-0 to Glaitness United. Performance of the night came from Real Dounby who held second placed Papdale Flyers to a 1-1 draw in an exciting game which could have gone either way. There were a number of other closely fought games on the night with scoreless draws between Spurs and Scorpions and Vikings and Hotspurs, and a 1-1 draw between Mighty Marvels and Dynamos. The Dynamos had a very good week winning both their other games and moving up three places in the league. It was also a very good night for Stenness Falcons and Glaitness United who won all their games to move into joint third position in the league, just ahead of the Kings who have three games in hand over their rivals. The Hurricanes now lead the league by four points from Papdale Flyers. The league resumes on Saturday 9th January with the top game of the night being the eagerly anticipated first meeting of the season between the two top teams - Hurricanes and Flyers. With third placed Papdale Kings having a week off, the top two - St Andrews Hurricanes and Papdale Flyers took full advantage winning all their games on Saturday night. Whilst the Hurricanes won their three games convincingly the Flyers had to fight all the way in the game of the night against Glaitness United. It took a free kick scored in the last second of the match to secure a narrow 1-0 victory for the Papdale team. There was a similar scenario in the Papdale Mighty Marvels versus Stromness Devils game where a goal just before the final whistle secured a late victory for the Marvels. Orphir Torpedoes had their best week of the season with two excellent wins against Evie and St Andrews Dynamos, the latter by a convincing 4-1 margin. Burray Boomerangs also played some of their best football so far and had a very good win against Firth Scorpions. The Boomerangs also had the satisfaction of being one of only two teams this season so far to score a goal against the Hurricanes. It was also a very good night for Stenness Falcons who won all their games to move into joint fourth position in the league, level on points with Glaitness United. The Dounby derby between Real and Inter proved to be the closest match of the evening. In the end there was little to choose between the teams and they had to be satisfied with a 2-2 result, the only drawn game of the evening. All teams have now played 18 games and St Andrews Hurricanes hold a narrow 2 point lead at the top of the Primary Indoor League. With the Papdale Flyers having a week of off, both Hurricanes and Papdale Kings took full advantage winning all their three games convincingly to make it a 3 horse race at the top of the league. The Papdale teams are in joint second place on 70 points behind the Hurricanes. The Hurricanes have now scored a remarkable 100 goals in all their games and only conceded two. The only other team to gain maximum points on Saturday were the Papdale Dales, who move into fifth place in the league three points behind Glaitness United. The top match of the week between Glaitness United and Stenness Falcons ended scoreless with United coming closest to winning the game, hitting the bar. Glaitness Rovers had their best week of the league beating the Stenness Pumas and only being denied a second victory by a late equaliser by Orphir Torpedoes. Most exciting game of the week was a 2-2 draw between Stromess Predators and Firth Scorpions, and there were also good performances by St Andrews Dynamos in beating Real Dounby, and Stromness Devils who held Hope Hotspurs to a 2-2 draw , being denied a win by a late goal by Hotspurs. With the leaders St Andrews Hurricanes having a week off, second placed Papdale Flyers took full advantage winning all three of their games convincingly to take over leadership at the top of the Primary Indoor Football League. Stenness Falcons also had an excellent week winning all three of their games including a hard fought 1-0 victory over Hope Hotspurs. This moved them into a top five place in the league. Pick of the games on the night was the 2-2 draw between Papdale Dales and Glaitness United with United scoring a late equaliser to earn themselves a draw. The only other team to gain maximum points on Saturday were the Papdale Kings, but they can count themselves lucky to have narrowly beaten their schoolmates the Dales by a single goal in a game where the Dales deserved more. After nearly 150 games of football the league finally produced its first score-less match between Firth Scorpions and Evie. For Evie it was their best night of the season winning both their other games including a narrow 2-1 win over Glaitness Spurs where they scored a late winner. Finally well done to Glaitness Rovers who won their first points of the season in a 1-1 draw with the Stromness Devils. Indeed had it not been for a Stromness equaliser in the last seconds of the match the Glaitness team would have been celebrating their first win. With the three top teams - St Andrews Hurricanes, Papdale Flyers and Papdale Kings all winning their games on Saturday night its as you were at the top of the Primary Football Indoor League. Hurricanes were given their stiffest test of the season by Glaitness United but still won their game by two goals to nil. Papdale Dales had an excellent night winning all three of their games and climbing up to fifth place in the league. This included a good 2-1 victory over Hope Hotspurs where they came from a goal behind. St Andrews Dynamos had their best week of the competition winning two and drawing one of their games - an exciting 2-2 draw with Stromness Predators. Performance of the night came from Glaitness Spurs who scored two late goals to hold their more fancied schoolmates United to a 2-2 draw. The pick of the games in Week 4 of the Primary Indoor football league was the clash of the two undefeated Papdale teams - Flyers and Kings. Kings took an early lead but this was cancelled out by a Flyers equaliser and with neither team able to steal a winner a very exciting and tense match ended all square at 1-1. In another exciting game Stromness Predators fought back well from two goals down to level against Inter Dounby only for Inter to score the winner in the dying seconds of the match.With the Flyers dropping their first two points of the competition, St Andrews Hurricanes took full advantage. In winning all their 3 games on the night they have now taken a clear 2 point lead over Flyers in the league. Kings have moved up into third place. The only other team to gain maximum points on Saturday was the Papdale Dales. Both Evie and Papdale Mighty Marvels had their best nights of the league so far, winning two of their three games. Unfortunately Burray Boomerangs were unable to field a team because of illness so the points have been awarded to the opposing teams. Week 3 saw a lot of exciting games and eventually after over 50 games we had the first draw in the league with Vikings and Spurs drawing 1-1. This led to some more draws and some very close games. Team of the night was the young Stromness Devils who had lost their previous games but put in tremendous performances to remain unbeaten on the night with two draws and a win. Hotspurs and Spurs also had good performances and remained unbeaten on the night. At the top there was no change as Papdale Flyers and St Andrews Hurricanes remain unbeaten. The Flyers were pushed all the way by the Predators though, narrowly winning 2-1. Papdale Kings also won all their games to remain unbeaten as well but have played three games less. Next week at least one of these teams will drop points as pick of the games will see the Flyers play their schoolmates, the Kings. Two teams lead the pack after the second week's fixtures in the OYDG Primary Indoor League completed on Saturday night at Picky. Papdale Flyers and St Andrew's Hurricanes both have 24 points having won all their 6 games so far. Whilst the Hurricanes had 3 comfortable victories the Flyers had a much tougher week with two of their games being narrow single goal victories. Hope Hotspurs were involved in two of the evening's closest fixtures - they competed well against the Flyers but lost narrowly 1-0 and followed this up with a very good 1-0 victory against the previously undefeated Glaitness United. It was also a good night for Inter Dounby, Stenness Falcons and Papdale Kings who won all three of their games. Saturday saw the OYDG Primary Indoor League commence, once again very generously sponsored by the S. & J.D. Robertson Group Ltd. Week 1 saw a lot of high scoring games with 5 teams ending the night on maximum points - Glaitness United, Glaitness Spurs, Papdale Flyers, Real Dounby and St Andrews Hurricanes. Although there were no draws on the night there were some very close games. First game of the night saw Real Dounby score with the last kick of the game to beat Orphir Torpedos 1-0. Torpedos also had another very close game leading Evie 1-0 only to lose 2-1. Pick of the games on the night was St Andrews Dynamos against Papdale Mighty Marvels with the Papdale team taking the lead twice only for the Dynamos to equalise twice and with only seconds left the Dynamos scored the winner in a game that could have gone either way. There was plenty of excitement and tension amongst a large crowd on Saturday night at Picky as 29 primary football teams battled it out for the two knockout cups of the indoor season. As with knockout competitions the drama of games being played to a finish resulting in a number of games being decided by penalty kicks added to the excitement. In the premier competition the previous weeks group matches had resulted in the top eight placed teams in the league winning through to the quarter finals of the Lloyds TSB Trophy. The first match of the quarter finals saw an excellent performance by Papdale Kings beating their more fancied school mates Papdale Flyers by 3 goals to 1. The Kings followed this up with a narrow semi-final victory over Papdale Dales to find themselves in the final where they faced the might of St Andrews Hurricanes. The Hurricanes were involved in an epic semi-final battle against Stenness Falcons in what proved to be the tensest game of the night. For the second week in a row the Falcons proved that they had the tactics to hold the Hurricanes and the game ended goalless. Indeed the Falcons can count themselves unlucky not to have won the game as they closest to scoring in normal time hitting the post. Similarly Hurricanes struck the woodwork in extra time. Neither team deserved to lose and eventually Hurricanes squeezed through 2-1 on penalties in a dramatic shoot out which included good saves by both goalkeepers and a penalty scored by Falcons that was required to be retaken and was subsequently missed. The final itself was less dramatic and although the Kings battled strongly the Hurricanes emerged victorious by 2 goals to nil thereby completing a league and cup double in what has been a marvellous season for the St Andrews side. This is the second season in a row that Hurricanes have completed the double. 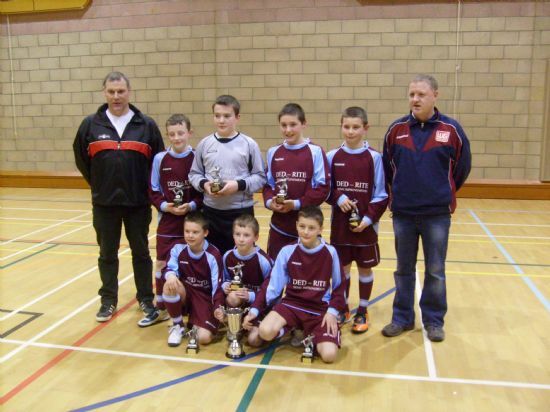 Congratulation are due to the St Andrews team who are probably one of the best ever teams to have played in the primary indoor football competitions. The other 21 teams took part in the Reid Crescent Shield and this was a competition where it was always going to be difficult to predict the outcome as there were a number of closely matched teams taking part. In the end it was perhaps surprisingly Evie and Stromness Predators who won through to the final. Evie’s march to the final included an excellent 3-0 semi-final victory over one of the favourites Real Dounby in a game in which they scored some very good goals. Stromness Predators had to negotiate some very tight games on their way to the final including a 4-2 win on penalties in the second round against Glaitness Spurs. The final was one game too many for Evie and Predators won fairly comfortably by 3 goals to nil. For both teams reaching the final was an excellent achievement - Predators winning the Reid Crescent Shield for the very first time and Evie can be proud as a small primary school that they performed so well in the competition. The East v West Challenge matches were both won by East. East B won fairly comfortably against their West counterparts by 3-0. The A game was a much tighter affair which went into extra time before a single goal sealed victory for East A. The presentation of trophies was held after the final match was played. Jim Cormack, OYDG Chairman opened the presentation ceremony by congratulating the winning teams - Hurricanes for winning the double and Predators for winning the Shield for the first time. He also commented on the excitement of having the non league teams involved in the cup competition with particular mention of Glaitness Swans who had taken his eye. He thanked all those that had contributed to a successful competition - Picky management and staff, fixtures organisers, scorers, temas, coaches, parent and supporters. Lloyds TSB Trophy and winners medals (presented by Margo McPherson of Lloyds TSB) to St Andrews Hurricanes. Saturday night at Picky saw the second week of the indoor primary football Knockout Cup - the Lloyds TSB Trophy. The format of the competition sees 29 teams split into four groups with each team playing each other. The top two teams in each group qualify for the quarter finals of the TSB Trophy with the remaining teams playing for Reid Crescent Shield both of which will be played in a knockout format this coming Saturday. On Saturday matches were played in the second two groups with 15 teams competing including some non league teams who were enjoying playing competitive indoor football for the first time. In the first group both the seeded teams Papdale Dales and Hope Hurricanes comfortably eased through. Dales won six of the seven games they played with the only blemish being when they were held 1-1 by their schoolmates Papdale Mighty Marvels who played well to earn a draw. In the top match the Dales comfortably beat Hotspurs by 4 goals to 1. There were good performances by the non league teams Glaitness Swans and Athletico Dounby against league opposition. The young Swans team backed by a noisy support won three matches including an excellent 1-0 win over Papdale Mighty Marvels. Athletico also held both the Marvels and Evie to scoreless draws. The two seeded teams in Group 2 St Andrews Hurricanes and Stenness Falcons also came out on top. In the top match an excellent performance by Falcons saw them hold the Hurricanes to a scoreless draw. In achieving this result Falcons became the first team to gain a result against Hurricanes playing their 45th game of the season. There were good performances by the two other St Andrews teams - Dynamos came third in the group and played very well on the night holding the Falcons to a 1-1 draw and only losing by a single goal to the Hurricanes. Non league Twisters also performed well against the league teams beating Glaitness Rovers and drawing with Papdale Vikings. Saturday night at Picky saw the start of the indoor primary football Knockout Cup - the Lloyds TSB Trophy. The format of the competition sees 29 team split into four groups with each team playing each other. The top two teams in each group qualify for the quarter finals of the TSB Trophy with the remaining teams playing for Reid Crescent Shield both of which will be played in a knockout format on Saturday 6th March. On Saturday matches were played in the first two groups with 14 teams competing including some non league teams who were enjoying playing competitive indoor football for the first time. Papdale Kings who were the top seeds comfortably won Group 3 and were the only team to win all their 6 games on the night. The race for second place was extremely tight with the other seeded team in the Group Inter Dounby only just edging out Stenness Pumas on goal difference after both teams ended level on points. For Pumas who won 4 games and also held Inter to an excellent 1-1 draw this was a remarkable performance as the previous week they had finished bottom of the league having lost all 40 games that they had played. The two seeded teams in the Group 4 Papdale Flyers and Glaitness United came out level at the top of the group each with 19 points. However neither team had it their own way with Flyers being held to a 1-1 draw by Firth Scorpions who played extremely well and United being held 1-1 by Stromness Predators in a game in which both goals came from the penalty spot. In the deciding group game between Flyers and United the most competitive game of the night ended goalless with both goalkeepers pulling off some good saves. Of the non league teams playing against more experienced league teams the best result was by Papdale Knights who beat Orphir Torpedos by two goals to nil. Following up their surprise triumph in the Gilmour Shield a fortnight ago, a combined Hope and Burray team completed the cup double by winning the Peedie Schools trophy on Saturday 26 June at Firth School. Despite only four teams entering this year, the competition threw up some close encounters and many excellent individual and team displays. After suffering heavy defeats to the Hope/Burray in the Gilmour Shield, Evie and Firth would not have been relishing the prospect of playing the south parish team again so soon. However, both equipped themselves very well, running their high-flying opponents close in both games. The other team in this year’s draw, Stenness, looked extremely confident in their opening fixtures. Boasting an impressive array of players with experience at Orkney age group level, the Milan of the Midwest were rattling in goals from all angles against Firth and Evie. So the scene was set perfectly for a final between Stenness and Hope/Burray. It did not disappoint. The attacking play from both sides was of the highest standard, but thanks to resolute tackling from all of the defenders, chances were limited. As half-time approached, though, Hope/Burray made the break through. A neat exchange from a short corner saw Sitte slot home a well-taken opener. The second half was equally tight, with each team exchanging a thunderously struck goal and quite a few more chances, as tired legs took their toll. In the end, the south parish team held out for victory, but Stenness pushed them all the way. Evie and Firth then fought out an exciting contest for 3rd and 4th place, with Evie just edging it in the end.So another enjoyable tournament drew to a close. Thanks to the referees and to Firth Community Association for their organisation and keeping us fed and watered. Hopefully 2011 will see a few more of the small schools throwing their hat in the ring.